Folks, I am more than a little proud of my Bratwurst kid. 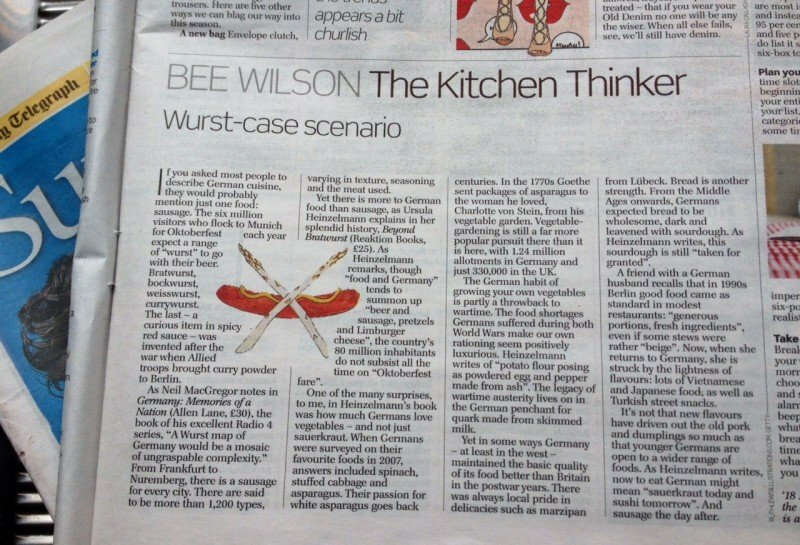 In February it made it into renowned British food writer Bee Wilson’s column „The Kitchen Thinker“ in the Sunday Telegraph, there was an extremely well written review in the Los Angeles Times by S. Irene Virbila, today Nikki Werner writes about it at length in South Africa’s Mail & Guardian – and then, the Times Literary Supplement! Nikki had met me here in Berlin in the summer, and it may have been the bottle of Julian Haart’s fantastic Riesling we enjoyed together that inspired her to ask all the right questions. In her long piece she points out the amazing similiarities between Germany and South Africa, way beyond Boerewors and Bratwurst, with an empathy that really touches my heart and soul. Bee Wilson shows her usual brilliant analytical mind and quotes Neil MacGregor who curated the very successful exhibition on Germany at the British Museum in London (where my Bratwurst was also on sale): „A Wurst map of Germany would be a mosaic of ungraspable complexity.“ Well said, Sir, my thinking entirely! However Bee goes on: „One of the many surprises to me, in Heinzelmann’s book was how much Germans love vegetables – and not just sauerkraut. When Germans were surveyed on their favourite foods in 2007, answers included spinach, stuffed cabbage and asparagus.“ We are wurst, but we are also more than that, so many things and persons at once. 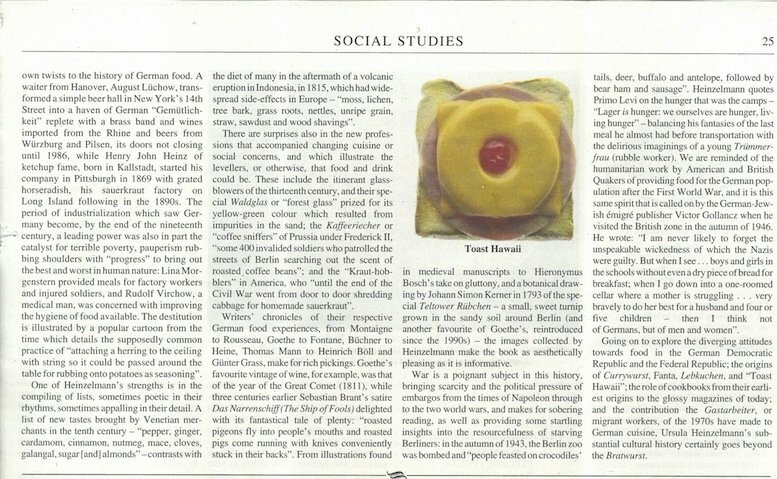 I’m also happy and grateful to announce that Rebecca Morrison reviewed my cultural history of food in Germany ‚Beyond Bratwurst‘ in the Times Literary Supplement (the July 25/2014 issue) and liked it very much. After the wonderful reception in July at the Oxford Symposium on Food and Cookery where so many of you had so many nice things to say about it (and bought so many copies), this is another milestone and wonderfully rewarding moment. I’m proud, honored, and grateful (and I apologize for the less than perfect copy of the review below – TLS subscribers will find it in much better and readable shape archived online). I love that Neil McGregor quote. I do have a Wurst map of sorts from Die Zeit magazine from several years ago which I love. It’s a little torn – such thin paper! – but bright pink and very cheerful indeed. Congratulations on the well-deserved mentions!